Perfect for gung ho gladiators, striving centurions and aspiring Caesars, these 17 Roman-themed activities will keep children amused for hours. Activities include a cardboard catapult, an Emperor’s wreath, a standing soldier paper-chain and printed mosaics. Every activity is clearly illustrated with easy-to-follow step-by-step instructions and comes with a few historical facts. 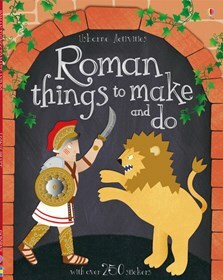 Includes over 250 Roman stickers to decorate the activities.